When you set out to change your life, you will inevitably set goals for yourself. But sticking to goals requires willpower, and willpower is a finite resource. You may keep it up for weeks or even months, but at some point the pressures of life will win out. And when they do, chances are you’ll end up back where you started. The way to make lasting changes is to build new habits. Once something is a habit, it no longer requires willpower to keep up. In fact, your brain will actively make you feel uncomfortable whenever you skip a habit. When you were a kid, you probably hated brushing your teeth and your parents had to push you every night. Now that it’s become a daily habit, you feel off if you skip it even once. But be warned: building habits takes time. Research suggests that building a new habit may take as long as six months. And getting to toothbrushing level takes even longer. So prepare yourself and don’t take this too lightly. 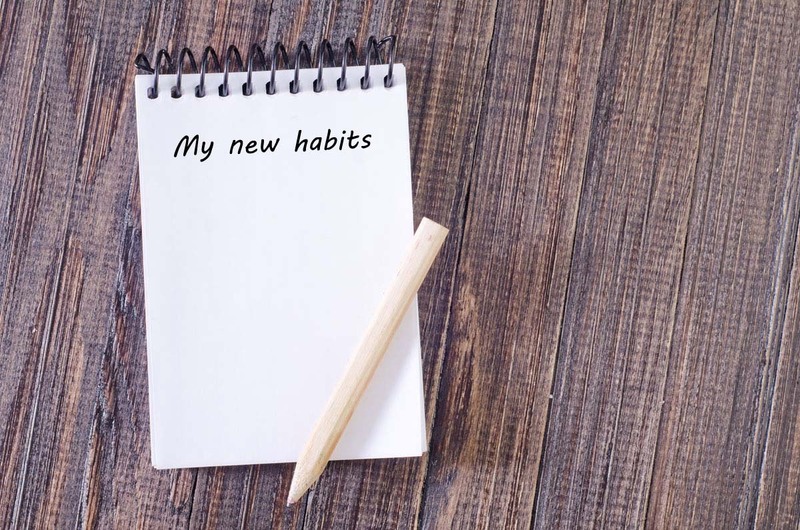 To increase your chance of success, choose habits you can easily keep up and find something to enjoy in every new habit. Daily habits help you go through your day without thinking about every little thing. When you introduce a new daily habit, plan a fixed time that fits the habit. You can even program a daily reminder into your phone for the first weeks or even months. We suggest you adopt the following daily habits. If you feel this is too much to change all at once, just change one or two habits at a time. Start at the top of the list then work your way down. Plan your meals at least one day ahead and do the necessary shopping. Don’t shop when you’re hungry. Stick to the food categories and make all your meals filling and delicious. Take a 30 minute walk, if possible in a natural environment. Go to bed by 10:30PM. Make sure your bedroom is dark and well aired. Create a special place (outside your bedroom) for your smartphone and leave it there at set times. We suggest you start with meal times, exercise (especially your daily walk) and during the night. Drink a big glass of water directly after every meal. Whenever you feel peckish, have a drink of water first. Do one all out sprint. This can easily be integrated into your daily walk. Modern life is easy. Whenever you need something, it’s never more than a short drive or a few clicks away. As a result, our bodies never lack anything and have become spoiled. Go deep on your exercises. It’s good to go deep on strength or sprint exercises now and then. Start doing this when you have built up some confidence in these exercises. Listen to your body and stop when it’s enough. Spend a whole day exercising. Once or twice a month, go for 27 holes of golf (on foot! ), hike up a mountain or take a 70 mile bike ride. Treat yourself to a long hot bath afterwards. Eat only plants. When we had to hunt to put meat on the table, it would not be uncommon to have days when dinner consisted only of tubers, mushrooms and leafy vegetables. Plan a meat free day once or twice a week. Eat plenty of vegetables, mushrooms and fruit. Never replace your meat with ultraprocessed soy patties; if you absolutely need a replacement, choose eggs. Skip meals. In nature, missing meals was a frequent occurrence and occasionally fasting has significant health benefits. Once or twice a week, don’t eat anything after dinner until lunch the next day. Make your lunch extra nourishing; don’t break your fast with chocolate and cookies. Whew! Those are a lot of habits to keep track of. In essence, many of these habits stem from when we led a more natural life where what we ate was tied to how much we exercised. If you are interested in exploring a more natural link between food and exercise, we suggest you download our free app and give it a try. It lets you earn foods by completing certain activities (they may look familiar). The Healthy Lives app is a motivational tool. If you can motivate yourself in other ways, that’s fine. The important thing is to adopt the habits outlined above. If you can use a little extra motivation, download the app today and give it a try. We advise you to use it for at least a week, because it will take a little time to get used to the daily app rhythm.